Our supplements are a non-intrusive step you can take to help you take back control of your health. Some supplements are designed to help treat and protect against UTI's whilst other help relieve stress or urge incontinence. Finally some incontinence supplements are designed to help relieve symptoms related to an enlarged prostate of BPH. 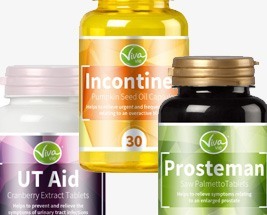 Includes the Vivactive range, created by us, which helps with issues ranging from UTI's to BPH. We're MHRA approved so you can buy with confidence.